Heather Dubrow is the author of six scholarly books, including The Challenges of Orpheus: Lyric Poetry and Early Modern England (Johns Hopkins, 2008). She has published poems widely and is the author of the collection Forms and Hollows (Cherry Grove, 2011). 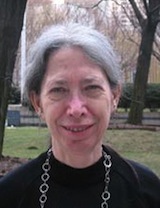 She is the John D. Boyd, SJ, Chair in the Poetic Imagination at Fordham University.